We are a leading printer of top quality sticker and plastic bag printing. We pride ourselves in offering the highest quality printing at competitive printing rates and a very fast turnaround rate. Our stickers and plastic bag prints are made with a perfect finishing and high standard printing material. We offer all this at amazingly low rates to suit every budget line so that you reach your marketing goals with minimum investment. We have the industry’s best printing specialists and designers working on our printing shop. Our team works at creating unbeatable quality standard prints to produce satisfying printing results. Moreover, our customer service staff is friendly and available round the clock to provide unfailing support for all your queries and problems. You can choose your print from our huge collection of sticker and plastic bag templates. We also offer custom designing facility to create prints as per your requirements. We assure you of a fast turnaround time, so that you can easily achieve your marketing and promotional goals within a minimal time frame. We also offer discounts for bulk orders, and require about 3 – 4 days (sticker) or 3 – 4 weeks (plastic bag) for printing purposes. 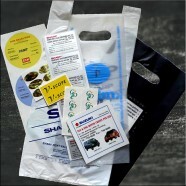 We also offer free shipping services to ensure your stickers and plastic bags reach you on time if and when required.